On the 21st October 2017, WomCam and Oh Rama will jointly host ‘Oh_Rama_the_EMPREXX’, a space for queer women and nb people – take up space! Incredible line up featuring DJs from the Brighton-based GALPALS. 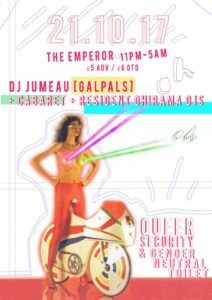 “Building on three years of eclectic queerdom, we have evolved into an interactive extravaganza with new DJs, new acts, and a licence to watch the sunrise. CHILL OUT SPACE: CUSU Women’s Campaign will take over the vibes + music + decorations + chats + cushions. Advanced tickets (£5) OTD (£6). See the facebook event here, buy tickets through eventbrite here.